The boy is five, the baby is no longer a baby. Time is passing, life is good. It can take us a while to catch on. For years we had listened to the conversations of friends buying homes near to decent schools. I say listened, actually it was more of a nod in the right place while thinking of weightier issues such as where to go on a Saturday night and which new outfit from Topshop might be best to buy for said night out. This was before the children made their appearance. And even then when we realised school days would be coming their way we did not fully think through the house-near-the-best-school-for-our-child-thing. It dawned on us around Christmas last year – approximately half way through Finn’s reception year. As soon as we understand we leap into action and get stuff sorted, y’know, just about a year late. It’s the same with family holidays. Buoyed up by the prospect of maternity leave plus parental leave rights for Ken last year we managed to have an extended holiday. We drove through Europe on a nine week break. It was a wonderful opportunity and I am glad we deferred some of the house renovations to pay for it. We imagined this might be the future of family holidays for us. Early in 2013 we started to discuss our next summer break. Where would we go, how long for, whether we should fly and so on. Checking out flights we were horrified. What? Wow, prices really do go up during school holidays. …by HOW MUCH? For some reason we had thought this topic was made of exaggerated moaning and that somehow we might be exempt from the price hikes. After scouring of websites we eventually decided to keep it as low cost as possible and have a ‘staycation’ (oh how that word jars but it’s the right description…). There are many parts of the UK I have not yet visited so I was open to the destination. And then an old friend got in touch. She is living in Suffolk after years in London and now has a family. An age ago we had discussed a swap of houses and she was wondering if we were still interested. We agreed a date and where to leave keys and that was it. And it didn’t feel like such a risk as we knew each other. We arrived at her place in late August. Suffolk is beautiful. Being in this steep sided valley means that when we set off on long walks one of us inevitably is in tears by the time we get home (by that I mean usually me; pushing the double buggy uphill homewards with the scooter and the bags hanging off the bars and two children refusing to walk). In Suffolk we walked for hours along the flat miles. My friend’s house is lovely and our children were ecstatic to find a place full of someone else’s toys they were free to play with. 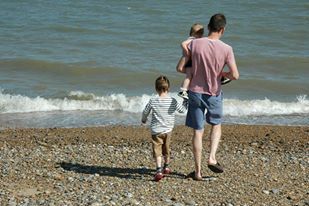 We spent blissful days on the beach at Aldeburgh and Southwold and enjoyed the warmer weather. During the holiday I did think if southerners are purported to be softer then it’s no wonder – I would be softer too in that climate. It was positively balmy in comparison to what we had driven from a few hours north. Hopefully we will be able to repeat the Suffolk experience again next summer and it’s made us braver when we started to look for an apartment to stay in Barcelona in April next year (we might even pay the sign-up fee on a house swap website to secure a place). 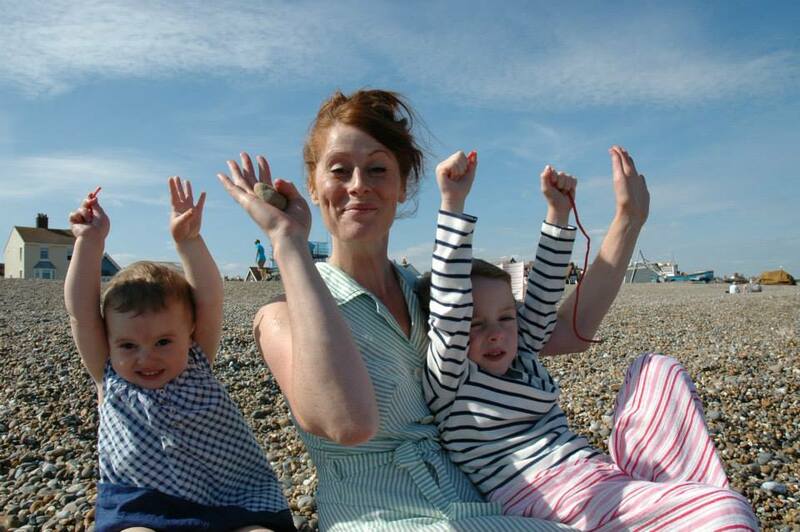 Hands up who likes the beach! Even though we are not particularly pleased about the prices of breaks during school holidays, this way we can continue to be blissfully ignorant about it. The Suffolk break was incredibly cheap – we struggled to spend money. A posh shopping trip to Waitrose with its food aisles of pre-prepared gorgeousness was perfect for holiday eating (no being tied to the kitchen for me), a couple of tanks of petrol and splashing out of gorgeous ice creams and we were more than satisfied.